If you haven't seen this concept, its all over Pinterest. 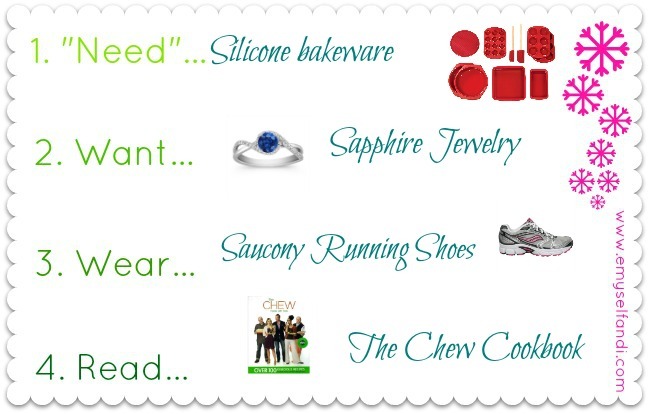 Its the 4 things wish list - something you want, something you need, something to wear and something to read. Its a great concept for kids to avoid the obsession with getting a lot of gifts. I had a really hard time creating a list for family this year. I really don't need more stuff. I have my perfect little boy and that is all I need. Andrew and I are terrible in the fact that if we want something we usually buy it. If its too expensive to buy now, we save and that would usually mean its too expensive for someone else to buy for us. I hope to implement this wish list with Sawyer when he gets older. Today I'm linking up with E over at E, Myself and I to share my wishlist. Sapphire is Sawyer's birthstone so I'd really like something to commemorate his birth. A necklace is probably more practical since I use my hands so much with work but I designed my own ring on the Shane Company website and kind of fell in love with it....Andrew, if you are reading this, take a ginormous hint. I would accept this as a birth-mas (birthday and Christmas combo) gift and not make you sleep on the couch. I love the idea of a piece of jewelry with your son's birthstone as a part of it. That's a sweet Momma gift.